Charles O’Brien was born in Eastbourne, England to Edinburgh parents while they were on holiday in the Sussex town, on the 6th October 1882. It was in Eastbourne that his parents first met:- his father Frederick O’Brien – a musician in the Eastbourne Orchestra; and his mother Elise Ware. Frederick was a founding member of the Edinburgh Musical Society and his son Charles went on to become a life-long society member. O’Brien received his musical education first from his father; and then from Thomas Henry Collinson who was the organist at St. Giles Cathedral in Edinburgh and conductor of the Edinburgh Choral Union. Charles followed up this education with a Bachelor of Music degree from Oxford and a Doctorate from Trinity College, Dublin. He was also mentored in composition by Greenock composer Hamish MacCunn. 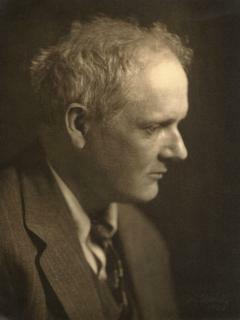 O’Brien worked in Edinburgh as an organist, conductor, pianist and music teacher. Following Collinson, he became the conductor of the Edinburgh Choral Union. He became the Director of Music at the Royal Blind School and later the Music Master of St. Serf’s School in the city. Like his mentor MacCunn, O’Brien had a romantic style and his works were steeped in Scottish themes. For example, his overture Ellangowan was inspired by the Sir Walter Scott novel Guy Mannering and its setting. Charles O’Brien died on the 27th June 1968. Toccata Classics has recently released a series of his works. 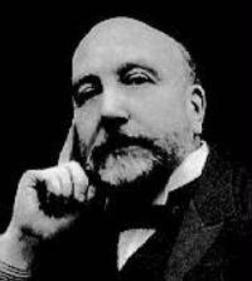 Sir Granville Bantock was born in London on the 7th August 1868. His father was the prominent Scottish surgeon and gynaecologist Dr George Granville Bantock. George’s father worked for the 2nd Duke of Sutherland, as gamekeeper and then laird, a few years after the Highland Clearances attributed to the 1st Duke of Sutherland. It is noted that the gamekeeper once offered 10 shillings each for White-tailed Eagle eggs in 1849. The Granville name was taken from the Sutherland Duke in tribute. George Bantock tried to guide Granville into respectable professions. Granville was first enrolled into the Indian Civil Service; and then chemical engineering, but before long his father was to enrol Granville into the Royal Academy of Music. On leaving the RAM he got a job as the editor of the New Quarterly Musical Review in 1893. In 1894 he became a conductor of light opera initially for the George Edwardes’ Gaiety Company and in 1897 he became a Musical Director of New Brighton Tower Pleasure Gardens. Then in 1900 he moved to the Birmingham and Midland Institute as Principal and in 1908 became Peyton Professor of Music at the University of Birmingham. He became a great champion of the Finnish composer Jean Sibelius. Sibelius’s 3rd Symphony is dedicated to him. Bantock spoke several languages and studied Latin, Greek, Persian and Arabic. Some of his work is inspired by the Orient or Classical Antiquity but he is more known for the works inspired by his Scottish and Celtic roots. His Eastern-inspired work includes the choral epic Omar Khayyám (1906–09) based on Edward Fitzgerald’s translations. The Orchestral tone poem Thalaba the Destroyer was based on the Lake Poet Robert Southey’s Arabian epic poem of the same name. Bantock was also to write Songs of Egypt, Songs of Arabia, Songs of the East, Songs of Persia, Songs of India, Songs of China and Sons of Japan based on his wife Helena Von Schweizer’s lyrics. 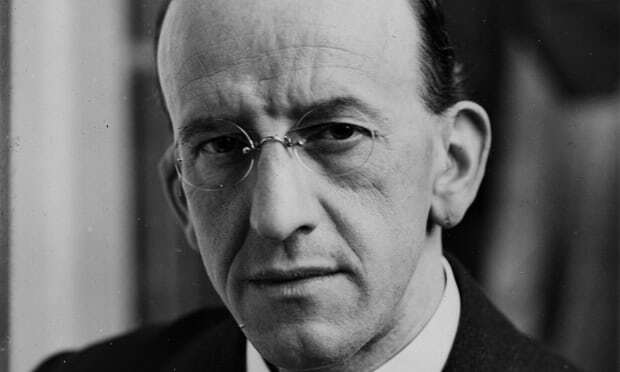 His Classical Antiquity-inspired work includes The Pagan Symphony (1928); his Third Symphony, The Cyprian Goddess (1938/39); The Sappho Songs and various incidental music for Greek plays including Electra (1909), Oedipus Coloneus (1911), The Birds (1946), and The Frogs (1935). A key influence in his Scottish works is the folk song collector Marjorie Kennedy-Fraser. Her collections of the Songs of the Hebrides (1907, 1917, 1921) provided the composer with a rich vein of material which he continually used. 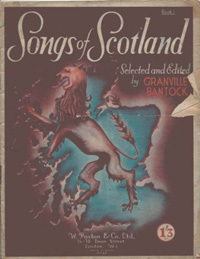 Before writing the Hebridean Symphony Bantock toured the Highlands and Islands. He composed the symphony in 1915 and conducted it first in Glasgow on Valentine’s Day 1916. The opening of the Hebridean Symphony is based on the lament Ho Roinn Eile which was given to Marjorie Kennedy-Fraser by Frances Tolmie, a renowned Gaelic song collector. Altered in the symphony and renamed The Seagull of the Land-under-Waves it remains a haunting melody. The Symphony makes its way through other songs like Kishmul’s Gallery, The Pibroch of Donnail Dhu, Harris Love Lament and finally into a Song of Victory. Sections of the symphony are based on songs collected by Kennedy-Fraser: Ailein Duinn, 0-hi, Shiubhlainn Leat [Brown-haired Alan, with Thee I Would Go]; An Seachran-Gaoil [The Love Wandering]; Heman Dubh [Hebrid Seas]; and An Sgeir-Mhara [The Sea Tangle]. The Sea Reivers (1917) was first performed in 1920. It is based on Kennedy-Fraser’s arrangements of the song Na Reubairean, which was collected from Penny Macdonald of Eriskay. The Seal-Woman (1924) is a two act opera. Kennedy-Fraser produced the libretto for this and even sang the role of ‘Old Crone’ in its first perfomance. The Celtic Symphony (1940) makes use of another Hebridean folksong An Ionndrainn-Mhara [The Sea Longing]. It is scored for a full string orchestra including 6 harps! These are just a selection of the composer’s Scottish-themed works. In fact Bantock became so obsessed with his Scottishness that his son Angus learned the bagpipes and another son Hamilton danced the Highland Fling and Sword Dance. 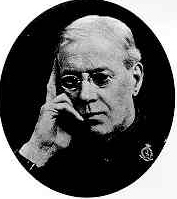 Bantock became President of the Glasgow Orpheus Choir under Sir Hugh Robertson. Robertson called him “the Laird” and wrote “the blood of Scotland flowed in his veins … a rich racial tradition, which, in his heart, he cherished”. Bantock was given an honorary Doctorate of Music by Edinburgh University. He was knighted in 1930. He was to die on 16th October 1946. The Bantock Society was established after this to promote his work. The composer Jean Sibelius became it’s first president. Eugen d’Albert was born in 4 Crescent Place, Charing Cross, Glasgow on 10 April 1864. There seems to be a bit of confusion regarding his exact place of birth in Glasgow; some sources stating 9 Newton Place in Charing Cross, and others showing Crescent Grove in Knightswood. Hence this page resolves the issue. Wikipedia is correct in stating that d’Albert’s birth certificate states 4 Crescent Place; also confirmed by census. His birth certificate states that 4 Crescent Place is in the Anderston district, but today that area is probably best described as in Charing Cross. The above 1857 map shows the Charing Cross and Woodside area of Glasgow. At the bottom of the map is Crescent Place. It shows that Crescent Place ran between (on left) Woodside Crescent and (on right) St. Georges Road. This stretch of St. Georges Rd is now known as North St.
Crescent Place is unfortunately no longer in existence. It has been replaced by a pedestrian overpass which runs from Woodside Crescent to Renfrew Street. Perhaps a campaign should be started to name this overpass in honour of Eugen d’Albert! D’Albert had an English mother, Annie Rowell, and a German-born father of French and Italian descent, Charles Louis Napoléon d’Albert (1809–1886), whose ancestors included the composers Giuseppe Matteo Alberti and Domenico Alberti. D’Albert’s father was a dancer, pianist and music arranger who had been ballet-master at the King’s Theatre and at Covent Garden. He was 55 years old on Eugen’s birth and was to be his first music teacher. At the age of 10, Eugen entered the National Training School (now the Royal College of Music) in London, where he studied piano with Ernst Pauer and theory with Sir John Stainer, Ebenezer Prout, and Arthur Sullivan (of Gilbert and Sullivan); and achieved early success in England as a bravura pianist. In 1881 d’Albert won the Mendelssohn Scholarship, enabling him to study in Vienna, where he met Johannes Brahms and Franz Liszt. From Austria he emigrated to Germany, becoming a pupil of the elderly Liszt and beginning a career as a concert pianist. At the same time d’Albert focused increasingly on composing, producing 21 operas and a considerable output of piano, vocal, chamber and orchestral works. His most successful opera was Tiefland, which premièred in Prague in 1903. His successful orchestral works included his cello concerto (1899), a symphony, two string quartets and two piano concertos. D’Albert toured extensively, including in the United States from 1904 to 1905. 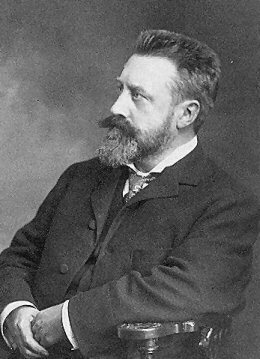 In 1907, d’Albert became the director of the Hochschule für Musik in Berlin, where he exerted a wide influence on musical education in Germany. He also held the post of Kapellmeister to the Court of Weimar. In the wake of his success, he adopted German citizenship, and made repeated statements derogatory to English culture and his former English music teachers. He further changed his first name from Eugene to its German form, Eugen. D’Albert was married six times: to Louise Salingré; to the pianist, singer and composer Teresa Carreño; to mezzo-soprano Hermine Finck; actress Ida Fulda; Friederike Jauner; and Hilde Fels. He had eight children. In 1914, d’Albert moved to Zurich and became a Swiss citizen. During World War I, he was vocal in his enmity toward England, which led in turn to an understandable repugnance among English musicians to accept his music. “Weel” said the clerk, “Ye’re nothing like so particular as a wee red-heeded fella who kept coming back here; he had a kinda queer name – whit was it noo? Albert something? Dalbert. That’s it. Dalbert. You-gene Dalbert. He was a pee-anist, too, and every time he was playing in Glesca he came up here to see if we would change his birth certificate. He didna’ want his fether’s profession to be jest ‘Dancin’ but ‘Maitre de Ballet'”. D’Albert died on the 3rd March 1932 at the age of 67 in Riga, Latvia, where he had travelled for a divorce from his sixth wife. In the weeks preceding his death, d’Albert was the subject of attacks by the press in Riga concerning his personal life. His last companion was a mistress, Virginia Zanetti. D’Albert’s final opera, Mister Wu, was left unfinished at his death and was completed by conductor Leo Blech. D’Albert was buried in the cemetery overlooking Lake Lugano in Morcote, Switzerland. Donald Francis Tovey was born in 17 July 1875 in Eton, England. His elder brother Duncan served in the London Scottish Regiment and was a founder of their Regimental Association, The Glenworple Highlanders. Both boys were musical; Duncan wrote military songs, and Donald began playing the piano and composing at an early age. Their father was assistant master of classics at Eton college. Donald’s gift was soon recognised and he was prevented from going to the public school by his piano teacher, Sophie Weisse. Instead he was taught counterpoint by Walter Parrett and composition by Hubert Parry. His career developed still under the tutelage of his piano teacher Sophie Weisse, she even financed his Piano Concerto. Miss Weisse had a host of contacts, and before long Tovey was writing articles for The Times too. In 1911 he began writing articles for the Edinburgh based Encyclopedia Britannica mainly regarding 18th and 19th century music. In 1914 he moved to Edinburgh and Scotland became his home from then on. (Weisse followed him, buying a flat near the university.) He became the Reid Professor of Music at the University of Edinburgh, taking over from Frederick Niecks, a post Tovey held until his death. In 1917 he founded the University’s Reid Orchestra which survived until the 1980s and taught many of Scotland’s up and coming composers of the time, Erik Chisholm, William Wordsworth and Robert Bruce among them. He was knighted in 1935. Tovey died in Edinburgh on 10 July 1940. He bequeathed to Edinburgh University his library of scores and music books. A portrait of him in concert at the piano by Morris Meredith Williams, art master of Fettes College in Edinburgh, is owned by the National Galleries of Scotland. Today he is best known for his books on musical analysis, but he was also a noted composer. George John Learmont Drysdale was born October 3, 1866 in Edinburgh. Through his mother’s side he was descended from Sir Thomas Learmont (c. 1220 – 1297) better known as Thomas the Rhymer. Drysdale would later compose a ballad in his honour. As a child he took piano lessons from his teacher Miss Turnbull who also taught Alexander Mackenzie. At school he was fond of designing theatricals and composing their music. The design influence was seen when he left school and studied architecture but the composition influence won out in him instead. He applied to the Edinburgh Royal College of Music in 1883 but was turned down due to lack of orchestration skills. His rejoinder was if he knew orchestration he wouldn’t have needed college in the first place! Instead he studied music theory privately under a Dr. Grieve and concentrated on his piano and organ playing. In 1887 Learmont got a job in the All Saints Church in Kensington, London where he was de facto organist, choir master and concert organiser due to the ill health of the principal organist. He enrolled in the Royal Academy of Music in 1888. He returned to Scotland in 1904, teaching for a short time at the Glasgow Athenaneum, but spent the rest of his short life composing. In 1909 Learmont returned home to Edinburgh and tried to set up a Society for Scottish music. (It came to fruition after his death as the Dunedin Association.) He never married and was devoted to his mother. She was to die suddenly in May 1909 of pneumonia. He was just finishing off his opera Fionn and Tera when he suddenly developed the same illness a month later. He died aged only 42 on the 18th June 1909. Like other Scottish composers of the time, his works are steeped in Scottish themes. Examples include the overture Tam O’ Shanter (1890), the cantata The Kelpie (1891), the opera The Red Spider (1898), the tone poem A Border Romance (1904), and the cantata Tamlane (1905). Other works include the operas Fionn and Tera (finished by a David Stephen), Flora MacDonald, The Oracle, The Vikings and numerous songs and ballads. There are currently no CDs of Drysdale’s music available, but it seems Chandos are currently considering it. William Wallace, namesake of the Scottish freedom fighter and patriot, was born in Greenock in the 3rd July 1860. As a composer, he went on to write a symphonic poem about his more famous compatriot. This Greenock William Wallace was a remarkable man. He was a doctor and eye surgeon, a classical scholar, a painter, a poet and dramatist and of course a composer. After studying ophthalmology at Glasgow University, he then decided on music and went to London to study at the Royal Academy of Music at the age of 29. He lasted 2 terms there, but taught himself afterwards. He was regarded as a rebel of his day, constantly challenging the staid nature of the music schools, calling on them to give ‘a chance to even the most bizarre and so-called eccentric compositions that are sent in’. To this end he also challenged the classical model and its composers: “If Haydn and Mozart were capable of profound expression in their work they certainly gave scanty indication of it.” he said in his 1908 book The Threshold of Music. He was a pioneer of the Symphonic poem. In 1905, on the 600th anniversary of the national hero’s death, Wallace composed Sir William Wallace, based on the tune of Scots Wha Hae. Along with other Scottish themes, Wallace also used works of many European poets. He was also to use numerology as a basis to his Creation Symphony. In the First World War, he returned to his medical profession temporarily as as an Inspector of ophthalmic units in Eastern Command, tending to the injured and dying at the Front. He was then in his fifties but treated around 19 000 cases and had only 3 weeks leave in the whole war!! Truly an exceptional man. He died on the 16th December 1940. You are currently browsing the archives for the 19th century category.